The ring-necked pheasant is the state bird of South Dakota, and fittingly so, the Asian native has taken to South Dakota as if it were indigenous to the area. The bird was successfully introduced to the state in 1908 after previous attempts proved unsuccessful, and, although the pheasant is thought of as the all-American bird, it was not given a place in John James Audubon’s book, Audubon’s Birds of America because of its Asian origin. The successful growth of the pheasant population in South Dakota over the past century has made South Dakota pheasant hunting the best in the country. The Black Hills is the only area of South Dakota where pheasants are not found, and the south-central region is where most of the birds are located. 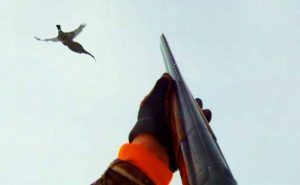 South Dakota consistently reports the largest numbers of pheasants in the United States and is a magnet for hunters wanting to experience pheasant hunting. The state offers the various habitats pheasants need to thrive. Woodlands and brushy thickets are necessary for the winter to provide shelter from snow and the wind, with wetland cover, also offering winter protection. These habitats also protect the birds from predators. In the spring grassland habitat is needed for hen pheasants to build and maintain nests. Areas in which more than half the land is farmed attract scores of pheasants, which get most of their diet from grain left on the ground and nearby gravel roads provide the grit the birds need to break up and digest their food. Regions, where these favorable conditions exist together, are the best for South Dakota pheasant hunting. Habitat is vital to increasing and sustaining high pheasant populations and ensuring the continued success of hunting pheasant. High pheasant losses in winter, about 65% to 75%, could be lessened if more food and shelter were available. As in other pheasant hunting states, more intensive farming methods have caused the pheasant population to decline. There is now less grain on the ground for food, and chemicals have also taken a toll. Pesticides kill insects needed by the young birds, the weeds and brushy cover the pheasants need have been eliminated, and nitrate fertilizers can poison the birds. Unfortunately, when the pheasant population dips, and so does pheasant hunting in South Dakota, with grave consequences for the state economy. South Dakota pheasant hunting provides a tremendous economic boost to the state. In 2005, pheasant hunting brought in over 153 million dollars. As important as hunting is, to South Dakota, it is important to create and maintain high-quality habitat that can support the pheasant population needed to bring hunters into the state. To guarantee the continued success of pheasant hunting state agencies, as well as groups such as Pheasants Forever, are working to make sure that South Dakota pheasant hunting remains a viable, successful sport for future generations.